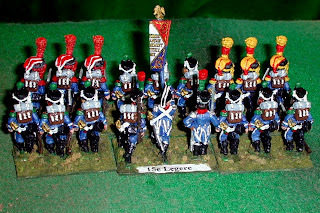 I have long had a special affection for the French Light Infantry of the Napoleonic Wars (Infanterie Légère), starting with the (French Language) copy of Fred and Liliane Funcken's L'Uniforme et les Armes des Soldats du Premier Empire that I bought circa 1970. Their paintings of French Light Infantry were especially animated and attractive. Thus it is hard to believe that I have left them for last among the French to cover! 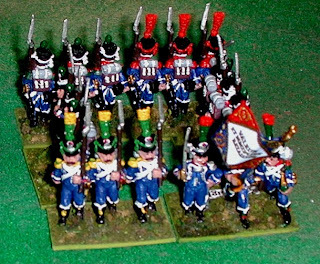 As mentioned last month, my standard French Napoelonic wargames "Divisions" each have 5 "regiments", 4 of Line (Ligne) and one Regiment Léger. 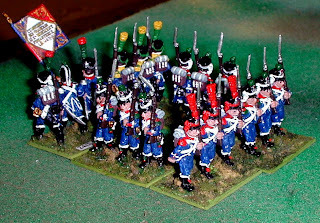 This post will focus more on the uniforms with more detailed information about their formation and organization in part 2. 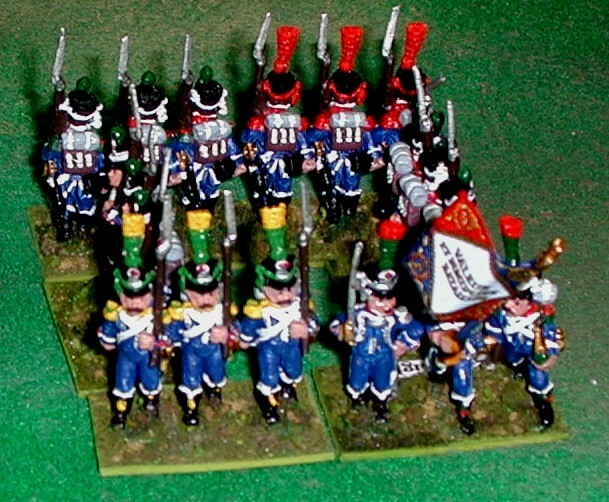 As usual, my units are organized and uniformed for the era circa 1809. First up is the 7e Léger, part of Gudin's Division. 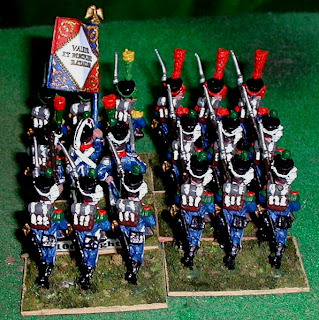 All the units in this post will be Wargames Foundy figures. By this time, the familiar French battalion organization of 4 center companies (called chasseurs in the Light Infantry regiments), 1 grenadier company (called carabiniers in the Light Infantry), and one light infantry or sharpshooter company (oddly enough, called voltigeurs in both the line and the light infantry units) was in force. The Carabiniers generally had red plumes, shako cords, epaulets, and red tassels on their boots and red sword knots. At one time, it was common for the Carabiniers to wear bearskins, but by 1809 that practice was fading, much as it was in the Line for the grenadiers. When worn, the bearskin lacked a front plate, might have red or white cords, and had a cloth patch at the top/back, usually being quartered in red and blue and bearing a white lace cross. 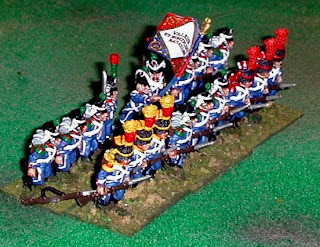 The Voltigeurs had yellow or buff (chamois) collars (often piped in red, blue, or white) on their uniforms, and used yellow as a distinctive color, usually paired with green and/or red, for their plumes, epaulets, tassels, sword knots and cords. 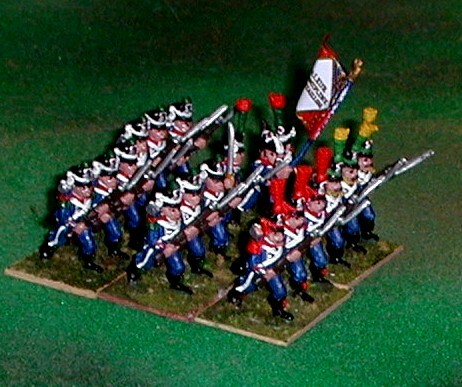 Just as in the case of the Line, there were an especially large number of variations in distinctions for the Voltigeur companies from regiment to regiment. 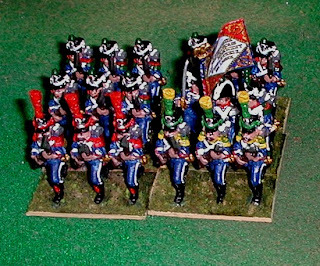 For most of my units of Infanterie Légère, I use green plumes topped with yellow, yellow epaulets with green crescents, green shako cords, and yellow tassels and sword knots. The four Chasseur companies of each battalion of Light Infantry often wore epaulets as well, the Infanterie Légère viewing themselves as elite units when compared to the bulk of the Line troops. These were most commonly green with red crescents, or just plain green. 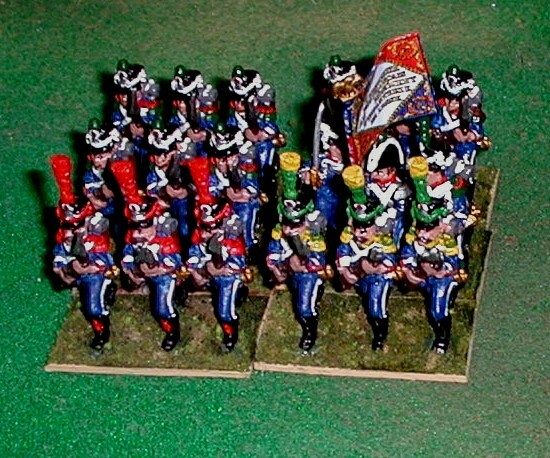 White cords on the shako were probably the most common, but green cords were also known. Plumes, where worn, were usually red over green, but the opposite as well as solid green were also known. The next unit up is the 10e Léger, which formed part of St. Hilaire's Division. 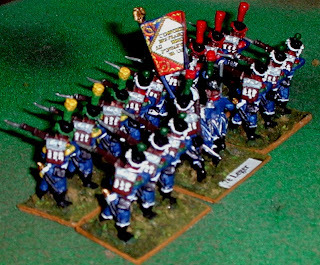 This was a famous unit, with an excellent fighting reputation. Like all the units of Légère, it wears a dark blue jacket (initially cut shorter than that of the Line) and pants, with white piping on the dark blue pointed lapels, and cuffs, and sometimes on the seams of the pants as seen here. 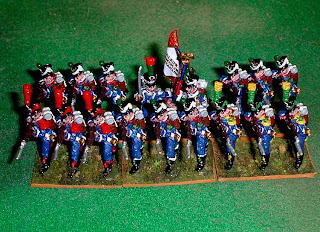 The collars (aside from the Voltigeurs) were generally red piped with white (or sometimes blue), as were the flaps of the cuffs. Some units wore pointed cuffs, others round cuffs without flaps. The buttons were all white metal, and belts were white. White metal was used for the chin scales of the shakos, as well as the cords and epaulets worn by the officers. 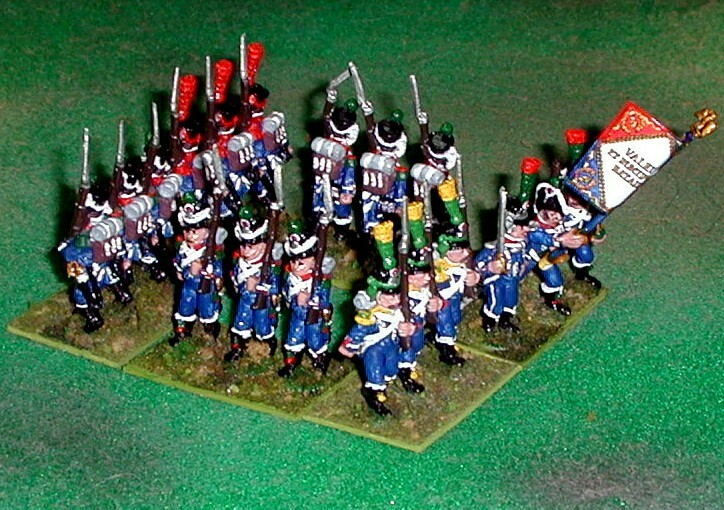 The pom poms of the Chassuer companies followed the same scheme as the Fusiliers of the Line - sky blue, purple, aurore, and dark green, but I prefer all of mine with green pom poms, and so they are here. 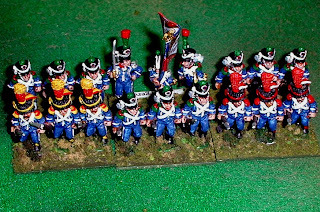 Formed up in square, we have the men of the 24e Léger, part of Cara St. Cyr's Division in 1809. This picture shows the silver accouterments of the officer well, along with his red over green plume. Another view of the 24e Léger. The Light Infantry often consciously imitated the style of dress of the Light Cavalry. Early in the Napoleonic era, it was common (regulation, actually) for the plumes (and cocade) to be worn on the left side of the shakos, but that had become uncommon by 1809. 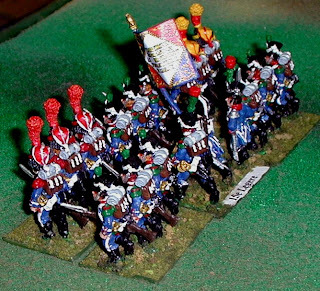 This picture shows the somewhat outdated bicorne worn by the standard bearer, and the white piping on the dark blue turnbacks. 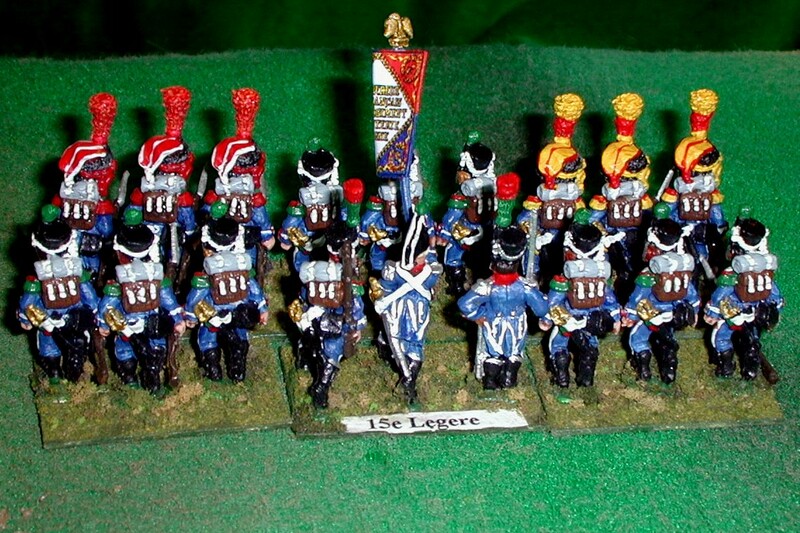 This unit is the 15e Léger, part of Friant's Division of Davout's Corps in 1809. 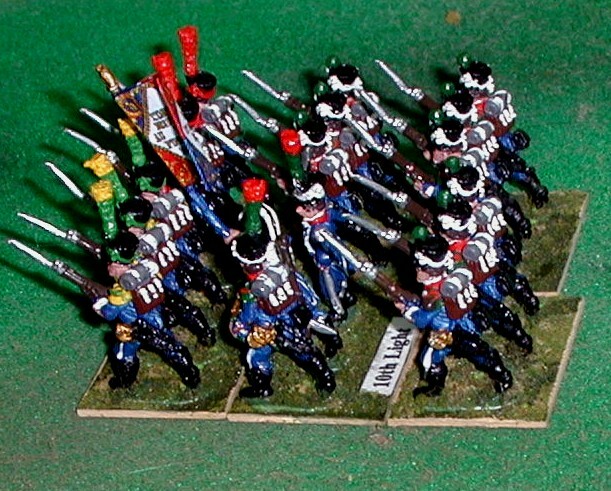 These Foundry figures are "Running, with muskets at trail". This is a suitable pose for the Infanterie Légère, which were supposed to be able to keep up with cavalry at the trot. 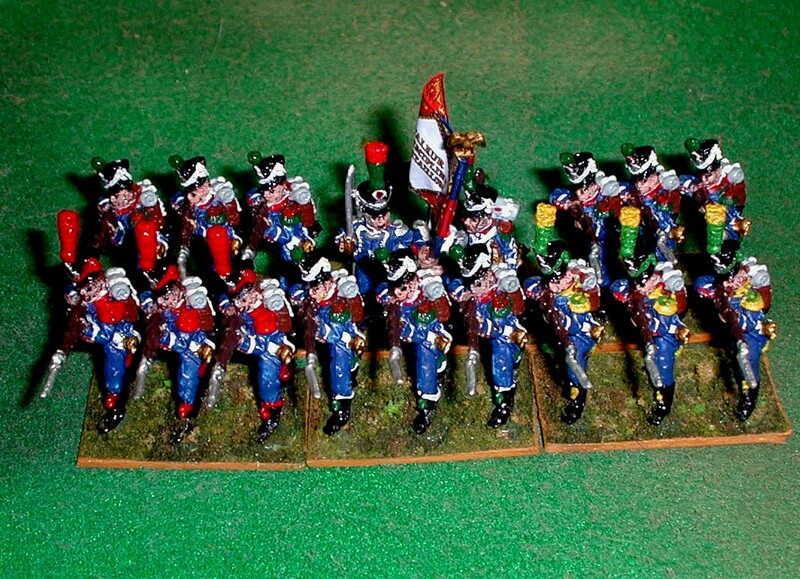 For this regiment, I have both the Voltigeur and the Carabinier companies wearing the busby. This was a common variant for officers of the elite companies in the Light infantry, and not uncommon for the Voltigeurs, but a rarity (although a known variant) for Carabinier companies. When the Carabiniers did wear the colpack, the most common pattern for the "bag" was as shown here; red piped in white (silver for officers). Dry brushing their red plumes with a light orange color has highlighted them nicely, I think. 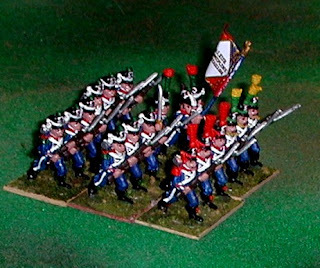 This final shot of the 15e Infanterie Léger shows the colpack of the Voltiguers nicely; here the yellow bag is piped in red, and the plume is red over yellow. The Magic Wash has once again brought out some of the detail on the yellow items. Green could easily have been substituted for red on the plumes and bag, or even a green bag piped yellow has been recorded. I must admit that I do like the jaunty look of those colpacks! This looks to be becoming an informative series. Thanks. Nice figures, too. A great informative post! Nice one!! Thanks, Gentlemen: glad you found it useful/interesting. These posts on organization and uniforms that you do are just great. A very good resource, thanks. Thanks, Mike! 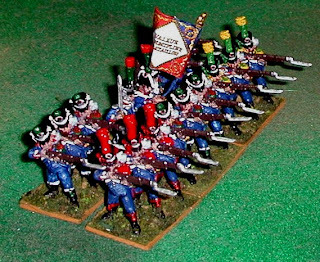 Believe it or not, I've nowe covered pretty much the entire French Napoloenioc army, aside perhaps from some posts on Generals, Staff officers, Engineers, Gendarmes and the like! 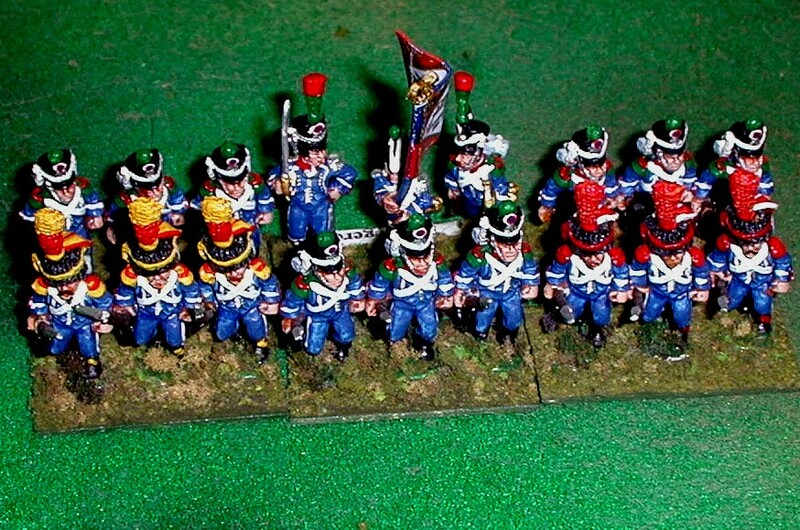 Still have to do the Hussars, Cuirassiers, and Uhlans for the Austrians (plus plenty of other nations). 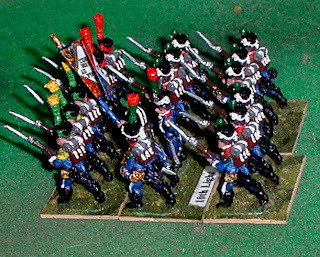 The Danish Army is another future project (posting about it; I've had the figures done for many years); there I have a lot of information that is not readily available to most wargamers. 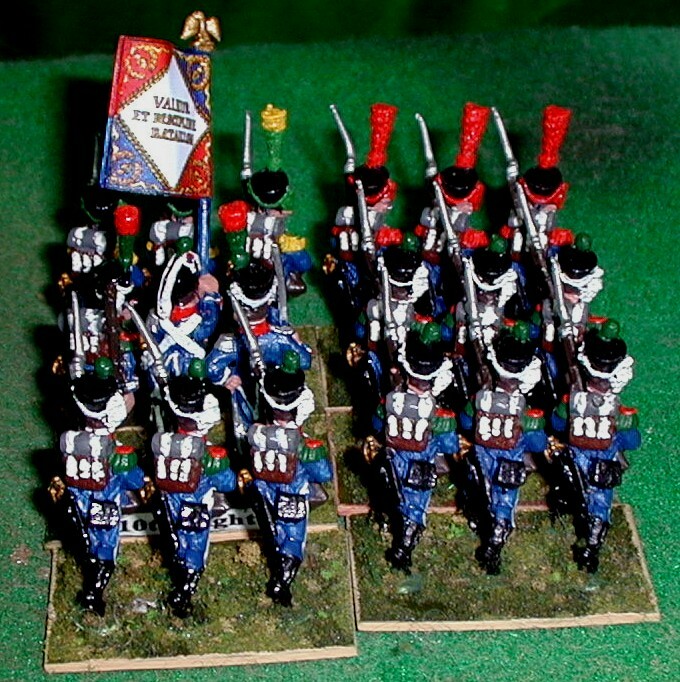 I like to make it clear when I deviate from what we know or believe to be true when posting pictures of my units... as well as why. 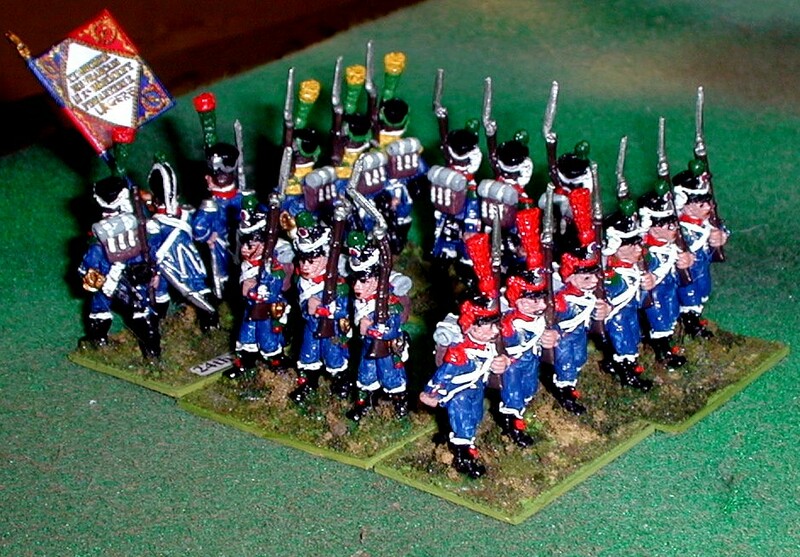 1) I'm the Emperor when it comes to my miniature armies, and I just think they look better all in green! 3) No need to do that for the Legere! You are the Emperor! I personally cut the plumes off most of mine. Plumes were dress uniform and bloody expensive . A lot of figure manufacturers read the uniform guides and go oooh big plumes.. which had there own container for storage, such as in battle. If lost a poor soldat would have to prove it was enemy action or it might be taken out of his already often late or diminished wages.